You bought a gun safe a few years ago. At the time, you thought you’d picked out a safe perfect for your needs—a selection you felt would provide security for ALL your guns, ammo, and accessories. Except for one thing. After buying that safe, you also bought more guns, ammo, accessories. Now your gun safe is maxed out. You’re out of room to add that long rifle you’ve had your heart set on ever since you first laid eyes on it. In fact, you don’t have space to stow even so much as an extra 50-round box of ammo. So you decide to get a bigger safe. You also decide to buy used because you recognize you can get more storage space for less money than if you bought new. 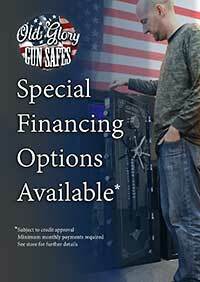 You also decide to offset the cost of the safe you’ll be purchasing by selling your old one. This gives rise to two big questions. If you’re buying, how do you know you’re not paying too much for that used gun safe? If you’re selling, how do you know you’re not asking too little for it? There are a number of factors that affect the value—and therefore the price—of a used safe. These include materials and construction techniques, the number of used gun safes available for purchase, and the size of the current demand for used gun safes. Those last two factors – supply and demand – are a bit tricky to gauge. The first factor is comparatively easier to gauge because it basically boils down to an analysis of the gun safe’s quality. Knowing the name of the maker of any given gun safe can tell you a lot about its quality. Some makers are known for quality, others are not. Identify the maker by locating the engraved name plate affixed to the gun safe’s bottom, back, or door frame. This tag should also give the gun safe’s model name, model number, and production serial number. Armed with those details, you can contact the manufacturer and ask what a fair price for that particular individual safe would be today. Please note: some manufacturers won’t or can’t answer that question, but if the gun safe was made by Old Glory Gun Safes, be assured you’ll receive the information you seek. In the event you’re unable to obtain valuation info from the manufacturer, your recourse is to search your files for the paperwork that came with the gun safe at the time of purchase (if you’re shopping for a used safe, this option won’t apply to you). The documentation that accompanied the gun safe should provide a rundown of features and specifications, all of which will help a gun safe expert—such as those at Old Glory Gun Safes—appraise the used safe. Alternatively, if you can’t locate the paperwork, you may be able to obtain the list of features and specifications from the retailer that sold you the gun safe (assuming you can remember where you purchased it and assuming the retailer is still in business). Don’t give up hope if it turns out there’s no manufacturer tag on the gun safe and there’s no time-of-purchase documentation. Most American-made gun safes have graphics of one sort or another emblazoned on their door. It could be a logo, could be an artistic design, could be a rendering of some object, animal, or landscape. Whatever it is, there may be a picture of it on the internet. Finding that picture can lead to discovery of the gun safe manufacturer. Simply go to Google or other favorite search engine, type in “gun safes” as your search term, and then click “Images” in the navigation bar atop the page. You’ll see countless photos of gun safes. Try to find a photo that most closely matches the graphics on the door of the used gun safe you’re buying or selling. If you’re successful, you should be able to extract from Google information about the manufacturer—and that could lead you to someone who can give you an appraisal. These are the gun safe attributes you should keep in mind as you shop for a used gun safe or as you attempt to arrive at an asking price for the safe you want to sell. These are the questions you need to ask about the integrity of the gun safe if it’s in used condition. · Has the gun safe been subjected to light, moderate, or heavy use? · Is the paint intact or peeling, new-looking or faded? · Does the lock operate easily and fully? · Does the door easily and fully open and close? · Is the combination written down and available, or is it lost/forgotten? · Does it appear that all visible parts are present? Where the gun safe is currently located, where it will go, and how it will get there are factors affecting price. Moving a gun safe from seller’s site to buyer’s site can involve potentially complicated logistics. You need to figure out all logistical considerations—including who will do the moving and using what equipment involving how much time and manpower—before you state an asking price or tender an offer. The easiest and quickest way to figure out the logistics and to obtain a fair, realistic appraisal of a used gun safe’s worth is to consult with an experienced gun-safe specialist. Among the free services available to you from Old Glory Gun Safe Company are used gun-safe appraisal and logistical planning.